By 1991, Swedish death metal was in full swing: Dismember, Grave,and Unleashed all released their debut albums, and Entombed unveiled their monstrous second album Clandestine. Unleashed and Entombed were probably the two closest linked bands in the scene; both bands sprang from the remains of Nihilist, the legendary crew that jump-started the Stockholm metal explosion. The split between the two sides wasn't friendly; Entombed's Nicke Andersson would later admit that the demise of Nihilist was largely to get rid of singer/bassist Johnny Hedlund, who would soon form Unleashed. This fascinating piece of inter-band drama sheds a lot of light on Unleashed and why they appear to be the odd men out from the rest of Stockholm's metal elite. Whereas the rest of their peers were synonymous with Tomas Skogsberg and Sunlight Studios, Unleashed would record their first album with Waldemar Sorychta (Century Media's in-house producer) and the rest on their own. Even in their approach to death metal, Unleashed eschewed the growing spectres of grind and tech-death for a stripped down, streamlined approach that recalls early Celtic Frost, Autopsy, and Death. And of course, there's that viking schtick. Horror movie Satanism was Entombed's bag, and Dismember favored gore drenched misanthropy, but no band since Bathory did more to stake their claim to the "viking metal" tag than Unleashed. Hedlund drank mead from a ceremonial horn between playing songs about Norse mythology. That's a man who's chuffed with Vikings. Where No Life Dwells, Unleashed's debut, encapsulates a moment of time for death metal as well as any other album from that period. In much the same way as Grave and Bolt Thrower, this first Unleashed salvo alternates between full throttle thrashing and melody-inflected doom. Without twin guitar harmonies or alternating rhythms, Unleashed's approach to death metal is as barebones as it gets, and lacking that trademarked Sunlight Studios crunch, the sound is unusually dry, almost sterile compared to their Swedish peers. 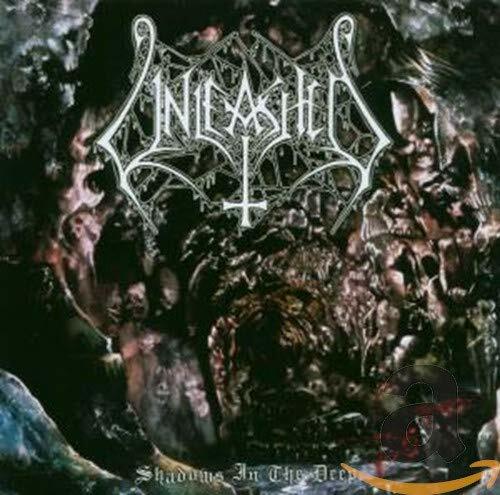 Unleashed's sophomore album, 1992's Shadows in the Deep, follows in much the same way as its predecessor, though with a touch more of its classic metal roots showing through on tracks like "The Immortals" and galloping title track. And as befitting a band that immersed themselves in history, the album covers a song from extreme metal's formative years, Venom's "Countess Bathory." While being an album that probably made Unleashed fans happy, it wasn't one that could be expected to create waves outside the world of metal. And it largely didn't, with the surprising exception that Dave Grohl recorded part of the song "Onward Into Countless Battles," which circulated for years as a Nirvana bootleg under the title "Dave's Meat Song". By 1993, changes were afoot in the world of death metal. Bands like Napalm Death and Cannibal Corpse were regularly being played on MTV's Headbanger's Ball. Major labels, always in search of "the next big thing," found themselves knocking on the doors of Satan worshipers like Morbid Angel. During this period, the touchstone bands of the scene had begun incorporating a variety of influences, including prog rock (Death), classic metal (Carcass), and garage punk (Entombed). In fact, Sweden became ground zero for the scene-within-a-scene of "death & roll", as Grave and Dismember followed Entombed's lead and began incorporating more rock and roll elements into their Repulsion and Autopsy-fused DNA. Little if any of this had an effect on Unleashed, who carried on in the same galloping Viking metal vein as before. Their third album, 1993's Across the Open Sea was my introduction to them, discovered at a time when the words "swedish," "death," and "metal," when used in proximity to each other, would empty any and all cash I had into the nearest register. And yet, Unleashed had very little effect on my teenaged self. The production, bone-dry as usual, felt primitive and amateurish compared to the increasingly more expansive work of Tomas Skogsberg, Colin Richardson, Fredrik Nordström. An amusingly cowbell-heavy cover of "Breaking the Law" aside, Unleashed felt safe and predictable, especially when compared to the unruly likes of Entombed and Dismember. The major stumbling block though were the vocals. There's no doubt in my mind that Johnny Hedlund is a legend; the term "Death Metal OG" was never more apt. And yet his vocals, a sandpaper rasp that often lacks power and range, always felt like a monotone afterthought over music that was already in danger of one dimensional. That, combined with the fact that he fronted a band that was hardly missed during its absence in the late 90's cemented in my mind that Unleashed were second-stringers in an increasingly more competitive and over-saturated death metal scene. And I would have stuck with that opinion if their most recent album hadn't forced me to re-appraise my view of them. Going back to Across the Open Sea 13 years after I first heard it and dismissed it, I can appreciate its conviction and single minded sense of purpose. It's a fun record with, dare I say, an almost punk rock sensibility: No frills, not in the production, the songwriting, or the vocals. Unleashed as a band always paid tribute to their influences, be it as Scandinavians (through the viking imagery) or metalheads (by covering classic bands like Judas Priest and Venom). And that's what their albums sound like to me now: 4 guys who play metal for no other reason than because they love metal. In the end, Unleashed's first three albums are the work of a band who refused to be anything but heshers for life. As a 31 year-old in a Napalm Death hoodie, I can appreciate that.